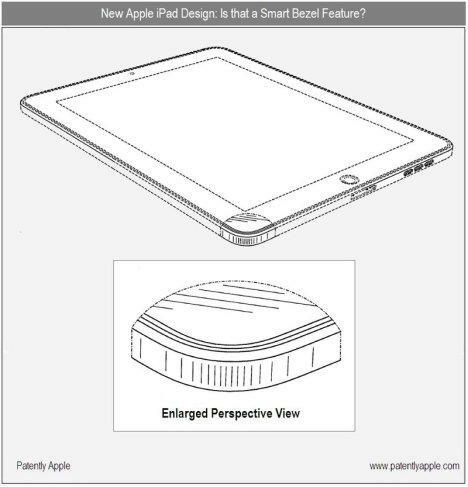 This week’s Apple patent news comes out of China, where a couple of new iPad designs have been discovered in line drawing, describing an iPad with dual dock connectors and an iPad with a smart bezel button. While most Apple patents are fairly ingenious solutions to simple problems, Cupertino’s solution to the problem of wanting to dock your iPad in landscape mode (or simply to dock it while you have the Camera Connection Kit attached) is so “no duh” obvious that it’s a little surprising that their patent attorneys bothered to submit it: instead of one dock connector, the iPad gets two. Yup, that’ll work. The smart bezel button is more interesting, though. The patent describes an invisible touch sensitive button hidden in the bezel that could be user programmable, but is invisible to the eye. This patent makes a lot of sense to me: I’ve long wanted one programmable function button on iOS devices, but Apple is not going to abandon their famous button minimalism just to give me easy access to Instant Rimshot. As with all Apple patent news, you can find the full details of the report over at Patently Apple.